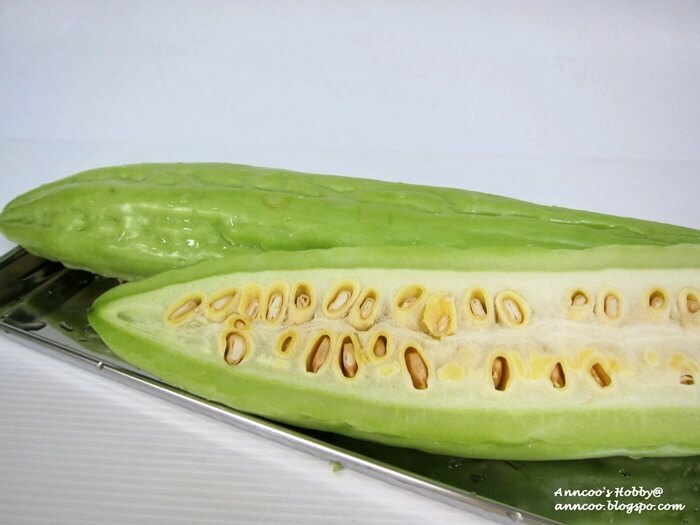 Bitter gourd (Bitter Melons) is often used in Chinese cooking for its bitter flavor, typically in stir-fries with pork or eggs, soup and even blended into juices with apples, carrots or other fruits. They are very low in calories. It is an excellent source of vitamins B1, B2 and B3, C, Magnesium, Folic Acid, Zinc, Phosphorus, Maganese and has high dietary fiber. Westerners may not be so used to Bitter Gourds, so may find them more difficult to consume. But if you can generally take bitter taste, you may be able to take this too. Try it, at least for all its healthy virtues! Marinate soft pork ribs with all the above for at least for few hours. Heat some oil in non-stick pan, fry fermented black beans, shallots, garlic and chillies. Add in bitter gourd with 1 tbsp Chinese cooking wine, fry well. Then pour the bitter gourd into the soft pork ribs and simmer for another 10-15 mins till bitter gourd becomes tender. Lori: Thanks for your comments. You may blend the bitter gourd with other fresh fruits into juice to lower the bitterness. I have been wanting to buy this at our Asian store but did not know how to prepare it. Thank you for your idea here. Westerners are so not into bitter – you are right. Everything is slathered in sugar- yuck. Not that I dont like sugar but there is just too much of it in America. Mary: Do you cook this in UK? Parita: Wonder how you cook the bitter gourd? JO: hehee…what did you cooked, love to have some. Angel: Never tried to add chilli paste before. Next must add some. Tigerfish: I think the mini bitter gourd (from Thailand) is the most bitter. You can give me bittergourd – I love it anytime! Nowadays, what's strange is that we can even find bittergourd which is not so bitter! Anncoo, I like this dish! My mom cooks the same way too, sometimes she will add in some chili paste as well. Sometimes she cooks with chicken. I tried cooking this dish before also. It's yummy yummy! mmm! looks so good! i always wondered what that thing was but now i know! my memories with bitter gourd is that it's one of the "torture" food that I had (together with all the other veggies) as we were forced to eat them before.. talk about child abuse then hahaha. your pictures are just awesome. so crisp! love the site! thanks for the constant visit! RV: It is common in Chinese cooking to add meat to the bitter gourd. We can also boiled as soup. Red Sister: You're right but cooking can always adjust the seasoning to own liking. If you think the black beans is too salty then you can reduce to half or just omit it. I don't think I had ever heard about bitter gourd before! It's certainly not something that you can find here or maybe I overlooked it. Interesting vegetable! I love bitter gourd. I have never used salted black beans before because I am afraid that it is very salty. I will try the next time. Looks delicious. Cannot trust some of the recipes, we must correct it because it turns out salty. I love bittergourd and this seems like a deadly combination. I have never imagined bitter gourd with meat.. I would love to try it with chicken sometime. Sharon, Sze Sze: Must try to eat some..good for health. HHB: Hope your son will like this dish after trying it. Mimi, Lynda: I think this is only available in Asian market. Kris: I love that. Sometime I saw from food store, they just stir fry bitter gourd with black beans and chillies. Hungrytummies: Next come to my place, I can share with you. LS: Yes this is really good for hot weather. Can make it into juice. Keats: Had never tried to grow bitter gourd, maybe I may give it a try. Murasaki: I remember in Taiwan, their bitter gourd is white in color and it is usually steamed and dip with sauce. Pepy: Yes we have it here too. Bitter gourd stuff with fish paste with dipping sauce or soup. Many people, esp. young kids don't like the taste of bitter gourds. Well, I might be the odd one. I like bitter gourds from childhood. 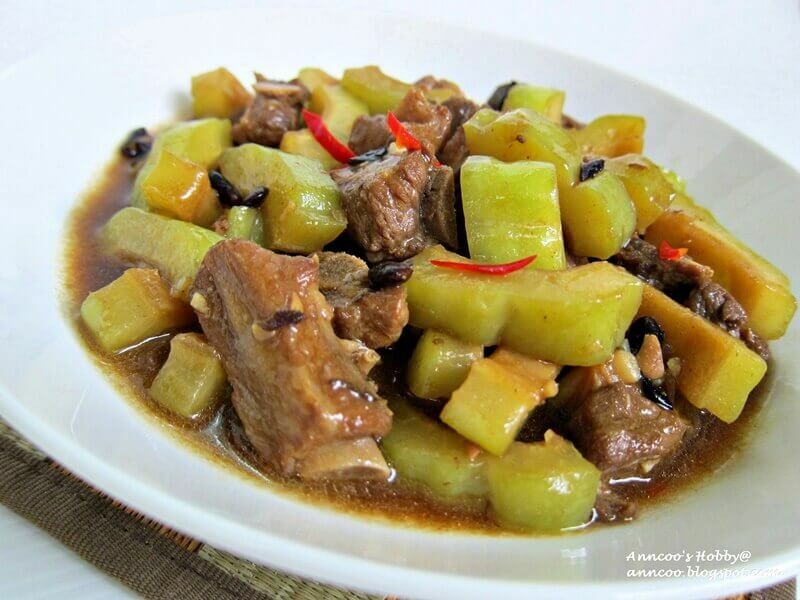 My mum used to cook it with beef, sometimes cook with pork ribs just like your dish here. I just love it. 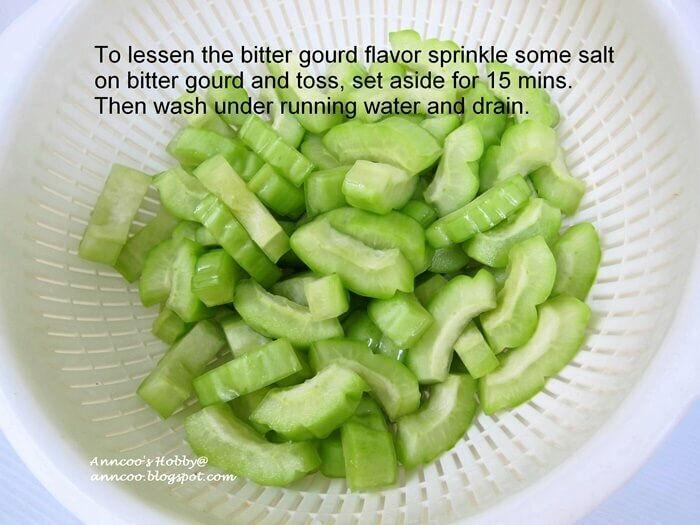 I have not had bitter gourd before, but this dish looks delicious. I'd love to try it. This looks delicious, but I'm not to sure about the bitter gourd. I have influenced my husband to like this bittermelon. I usually cooked for siomay (stuffed with fish paste and steamed and eat with peanut sauce) or stir fry with tauco and shrimp. 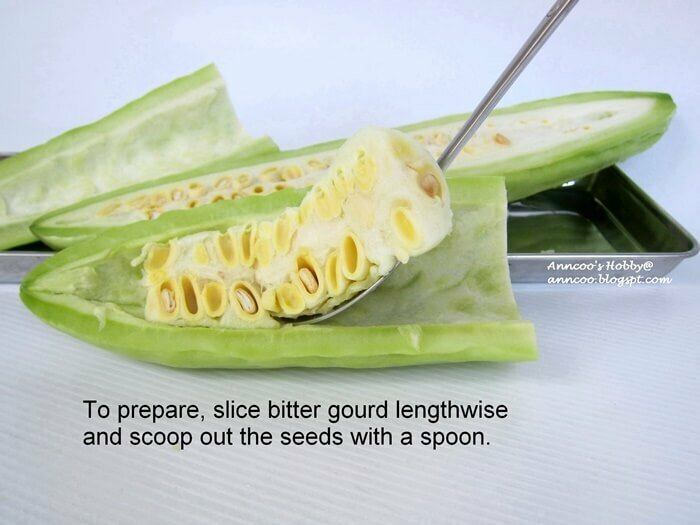 I have never tried bitter gourd before but now you have me intrigued. Anything that looks that delicious cooked up with those tender pork ribs has to be worth trying! Cheers. I like my bittergourd cooked tihs way too! So good with rice! I love bitter melon & pork. Mine is based on what I had in NW China though and looks somewhat different from your version. Nonetheless I'm sure this tastes great! I cooked bittergourd with chicken a while back, and yet to post. my husband and I love it but not my children. Velva, Lindsey: I think you can only find bitter gourd in Asian market. Busygran: Yep, method is about the same. I never fry bitter gourd with salted egg, next time must try it. Wiffy: Soft pork ribs （软排骨) is the type you have in dimsum ~ steamed pork ribs. This is more tender and takes shorter time to cook. Get this from the market and tell the butcher what type of pork you want. Kristy: You're right, most kids don't like bitter gourd. I bet my children won't touch on this! haha…. They hate bitter gourd. Good then my hubby & I can finish everything by ourselves. Hope you're having a nice evening. I have to try this next time, so far only did bittergourd stir fry egg. What is soft pork ribs? different from usual pork ribs? Both husband and I love bitter gourd! Thanks for sharing the recipe, will definitely try this!